Dog furniture such as beds and other pet accessories don't need to look plain and boring. 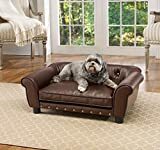 There are some really cute designer style choices for small dog beds for breeds such as Yorkies, Scotties and Westies that can be extremely stylish and glamorous placed in your home. The selections here are all items that you really won't want to position off in one corner where they can't be viewed easily. These particular beds have been designed for maximum viewing and are ideal for placing in your bedroom, in the lounge or any other room of your home or living space. Having their own special space in the home where they can sleep and snooze will help to prevent your little friends from scratching up other pieces of furniture with their nails and also from shedding fur or even dribble where you would rather they didn't. Finding and choosing the perfect place for your loved pet to snuggle up in peace can be more affordable than you might think and there are a range of gorgeous homes and items to choose from that your little pal can be happy, safe and snug in while they snooze. Some of the most attractive pieces of furniture are these upholstered style options which are fashioned like sofas, chairs and classically elegant chaise longues. These are items which can look good positioned in your bedroom, living space, kitchen or indeed anywhere in your home. If you're always telling your pet to get off your sofa, why not buy them their very own furniture to use instead. 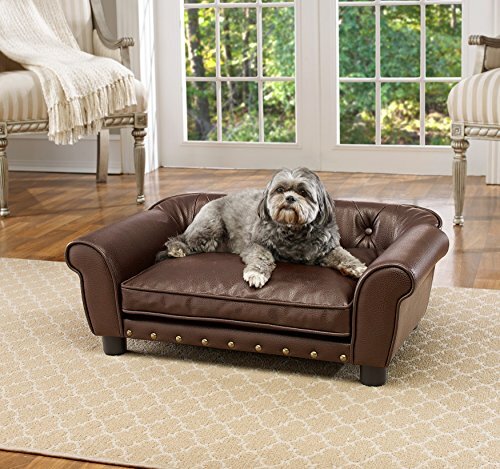 I love the look of this fully upholstered mini sofa style bed which has been made specifically for small breed dogs weighing 30 lbs or less. 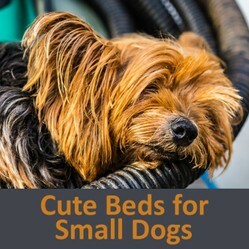 This could suit Yorkshire Terriers, Scottish Terriers and Cairn Terriers although you'd want to weigh your actual dog to be sure they come in under this since weight is something that really differ. Also make sure to check on the product sizes too. The smooth material can be wiped over and spot cleaned with a damp cloth to keep it clean which should make it nice and practical to care for. 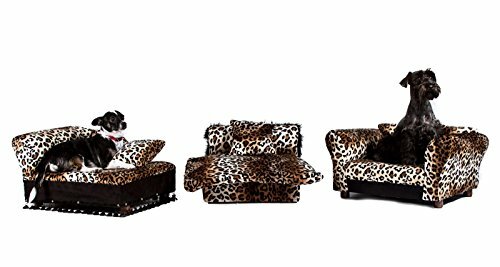 If you have more than one dog to cater for or you need a selection of places where your doggie can sleep and snooze around the home, consider this matching 3 piece set which includes a little sofa, chaise and bed all decked out in faux fur leopard print fabric. For up to 15lbs in weight. For a delightfully girly option look for a hot pink and zebra print small round pet bed. The pink crocodile textured vinyl covering (not pictured) is easy to wipe down and you can also remove the slip covered cushion for easy care too. It looks ideal for a fashion forward little pooch. 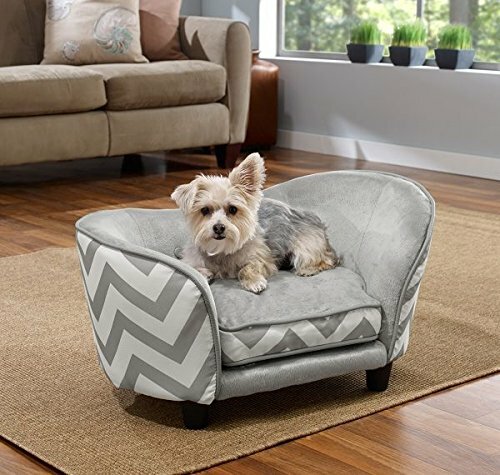 This more enclosed solution (normally called a snuggle sofa) wraps a little more around your dog to keep him or her sheltered more in case of drafts. It has a very stylish chevron design (you can get other options and color choices for this design to pick from) and it could work especially well in a more modern setting. For dogs up to 12lbs in weight. Male and female dogs can both enjoy a simple yet stylish sofa of their own to sleep, lounge, snooze and lie on. This is one piece of furniture that you don't need to shoo them off of. This is raised up from the floor slightly on raised legs to help to keep your best pal warm and cozy. At the high end or the luxury budget scale are these options which really ooze style. These would look terrific in a modern and high-spec apartment or home and would not look out of place at all in that type of setting. No need to compromise on valuable space with a really stylish indoor pet home that doubles up as a modern looking side table too. This wooden dog crate and can be placed next to a sofa, chair or even your own sleeping furniture so you can take advantage of using it to place your drinks, snacks, book or Kindle while your pet snuggles up inside this safe and robust home. I love pieces of furniture and home decor that have multiple functionality and this little home is very clever. 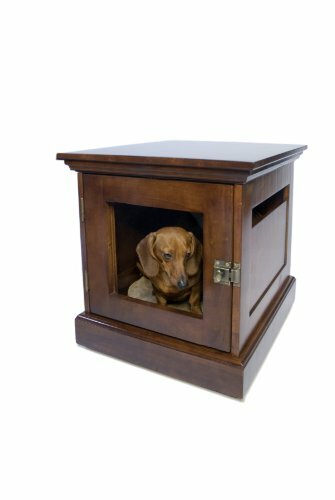 It makes a very safe, robust and snug house for your dog to rest in while it can also be enjoyed and employed as a very useful side table too. Side tables are great in many areas of the home such as next to a favorite armchair, sofa or your own bed where you're likely to place drinks, snacks or the book you're reading. And your best friend can be right next to you in their own stylish, designer den. Enjoy picking out a cool place for your dog to snooze. A dog bed might be a bit small but they do look pretty cute I agree. I wouldn't mind to have one of these cute beds for myself!